Within the property maintenance sector of our business we offer a unique service to our clients. 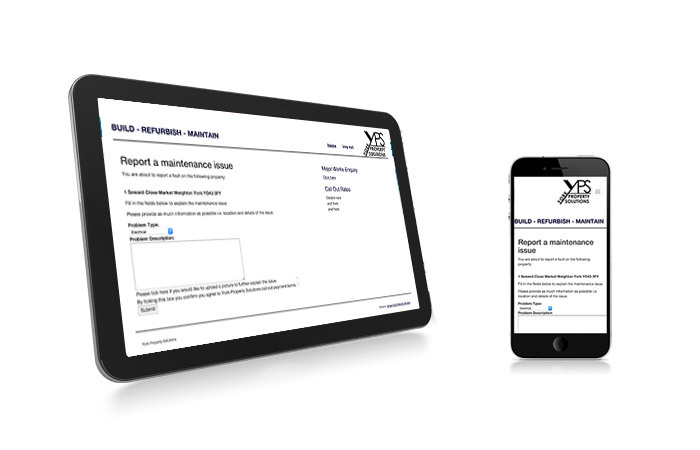 One phone call or report on our online maintenance portal and we can supply the solution to your problem using experienced tradesmen from all industry sectors within our team. All maintenance works will be fully project managed ensuring efficient coordination of multiple trades and completion of the works in a professional manner. We consider no maintenance works too small and strongly recommend a proactive not reactive attitude towards property maintenance, resulting in significant financial savings in the long run. We know that good property maintenance management is the key to harmonious landlord and tenant relationships, responsible occupancy and minimal void periods. Our team are on hand to react quickly to all necessary repairs. Be assured our team are very experienced in the rental property market and have the ability to address all issues including gas and electrical works. Our online maintenance portal allows tenants to log their issues online from which we can fully manage the repair. Throughout the whole process we keep both the landlord and tenant fully updated on progress. This is a free service to landlords and removes the time needed to be on hand for tenants. Within this service we offer a 24-hour emergency call out to cover the unexpected. Our current partnerships with local letting agencies has developed our rental property maintenance knowledge enabling us to offer an all-round service for rental properties and we know you will find our system revolutionary and easy for all involved. Simply click below to get started.